Cocolalla Lake was once an ice farm producing 200 pound blocks of ice that were in high demand by the Northern Pacific Railroad. Driving past Cocolalla Lake in North Idaho during the winter, the traveler will see several fishermen huddled over a hole in the ice fishing. There is no indication that this popular lake was once a famous ice producing area in the early 1900’s. Before the convenience of freezers and bags of ice at every store, ice was a natural product, harvested from winter lakes and transported all over the world. Cocolalla Ice & Fuel Company owned by E. J. Bower was located at the southeast section of Cocolalla Lake. The business incorporated in 1903 and ran until 1929 when it was replaced by the development of the mechanical ice maker. By 1921 it was the largest ice company west of the Mississippi River. Harvesting ice from the lake was not an easy task. Teams of horses would drag a scraper to clean the fresh snow off the ice to produce the favored “blue ice” (ice with little or snow on its surface). More teams of horses would pull a “marker” that cut the ice 1” deep creating an indentation for a plow that would cut the ice 5” to 6” deeper. Once the large chunks of ice were free, the horse teams pulled them to the water box where a worker used a needle bar to break the cakes into smaller blocks of 100 to 200 pounds. The blocks were moved by a conveyor belt from the bank to the ice house and loaded onto the waiting refrigeration cars of the Northern Pacific Railroad. Cocolalla Ice & Fuel Company’s ice plant employed 300 men and used 60 horses during the season. The plant held two bunk house, a barn, a blacksmith building and the 700’ long x 20’ high ice house that held 32,000 tons of ice. Sawdust from local sawmills proved to be a great insulator, and protected the ice over the warmer months. Lake ice and the railroads revolutionized American agriculture and economy by creating a transportation system to move fresh fruit and vegetables from regional areas throughout the nation quickly and inexpensively. It wasn’t until the 1950’s when mechanical refrigeration cars replaced the ice filled cars. Today nothing remains of this once large ice factory on the bank of Cocolalla Lake. The company and the traditions of cutting ice have become past history in many communities in the Pacific Northwest. Moving ice on Cocolalla Lake: The workers are moving the floats of ice on Cocolalla Lake for the Cocolalla Ice and Fuel Company. The sections of ice appear to be thin; however, they are normally a few feet thick. They were later cut into smaller cakes of 100 to 200 pounds each. Photo donated by Dale Eich and courtesy of the Bonner County Historical Museum. 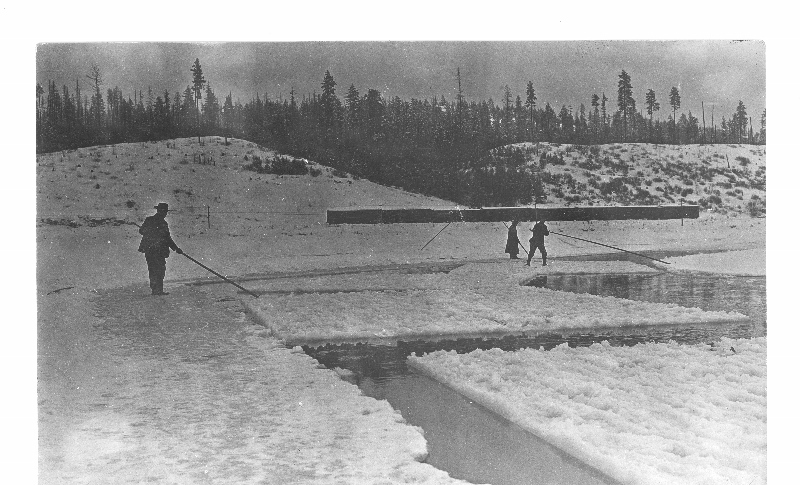 Cutting ice blocks on Cocolalla Lake: Cutting ice on Cocolalla Lake in the 1920’s. Once the ice was cut into large block, horse teams would drag the blocks to shore were men would use needle bars to cut the ice into 100 to 200 pound blocks. Photo donated by Lou Hoffine. Courtesy of the Bonner County Historical Museum. The Cocolalla Ice and Fuel Company's ice house at the south end of Cocolalla Lake. : The Cocolalla Ice and Fuel Company’s ice house on Cocolalla Lake. To the right is the conveyor belt that was used to load the blocks of ice into the storage building and onto the awaiting train cars. Photo donated by Evelyn Keller. Courtesy of the Bonner County Historical Museum. 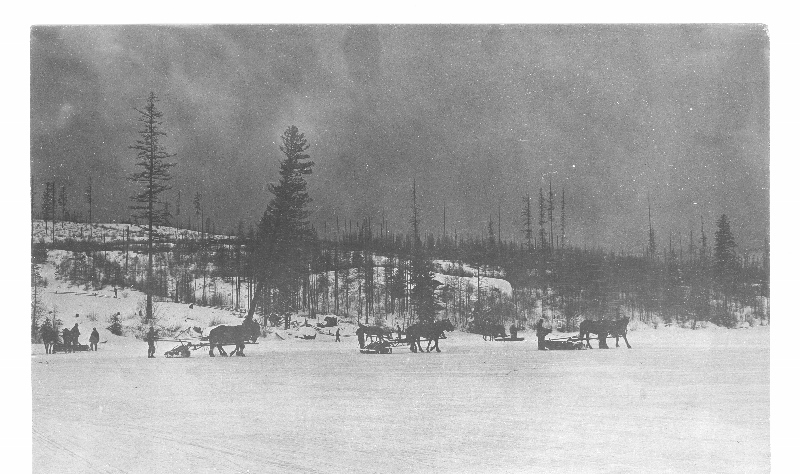 Horse teams scraping snow from the ice field on Cocolalla Lake in the early 1900's,: Scraping snow from the ice field on Cocolalla Lake for the Cocolalla Ice and fuel company. The teams of horses would scrape the ice several times a day to assure the quality of the “blue ice” (ice with little or no snow on the surface). Photo donated by Dale Eich. Courtesy of the Bonner County Historical Museum. 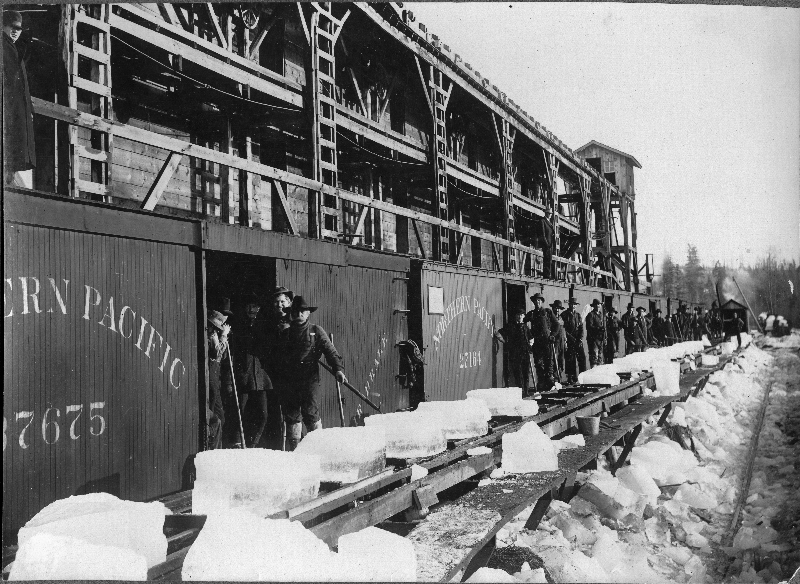 Loading the Northern Pacific Railroad refrigeration cars with Cocolalla Lake ice. : Workers of the Cocolalla Ice & Fuel Company are loading the 100 to 200 pound cakes of ice on the Northern Pacific Railroad refrigerator cars. The ice house would hold between 15 to 20 of these cars at one time. Photo donated by Dale Eich and courtesy of the Bonner County Historical Museum. 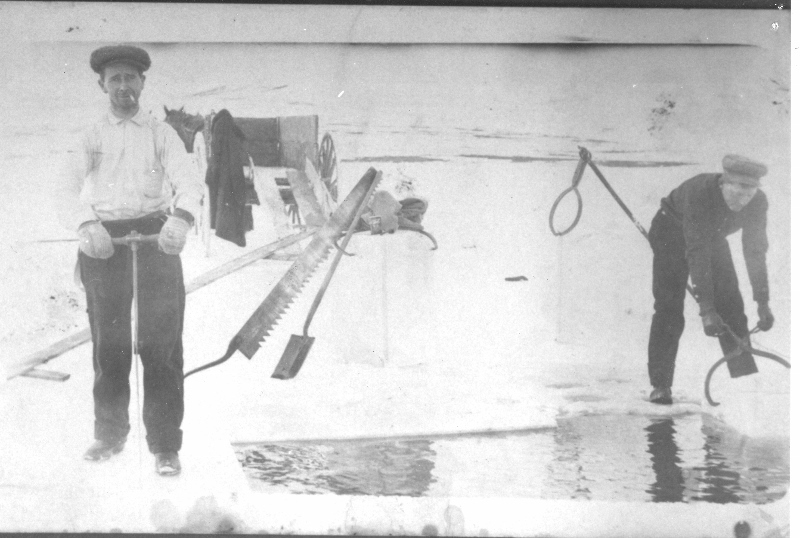 Mary Garrison, “Ice Harvest on Cocolalla Lake,” Spokane Historical, accessed April 20, 2019, https://spokanehistorical.org/items/show/578. Before the electrical ice making machines existed, ice was harvested from many small lakes throughout the nation. Renk, Nancy Foster. Driving Past: Tours of Historical Sites in Bonner County, Idaho (Bonner County Historical Society, 2014). Gunter, Bob. Bonner County Daily Bee. “Cocolalla Ice Plant Workers had Harvesting down to a Science,” November 27, 2010.